P’ng explaining about Yogipoco Adventure - his class assignment that became his first published game. 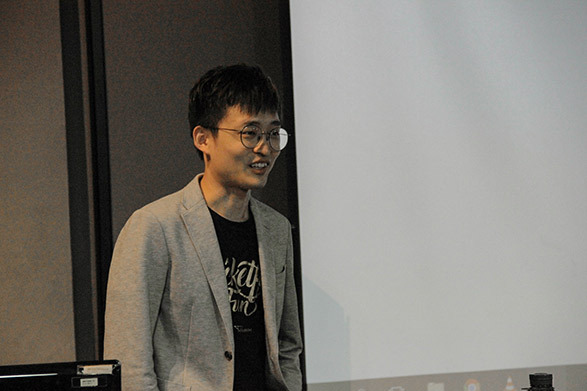 P’ng Yi Wei, an alumnus of The One Academy’s School of Digital Media Design, recently shared his journey of how his class assignment inspired him to take it to the next level, eventually kick-starting his career as a game developer. However, his road to success wasn’t all smooth sailing, but with keeping a strong mindset coupled with unwavering passion and steadfast discipline, he is still doing what he loves today. Through this sharing session, he aimed to inspire students to broaden their horizons and see the potential of their assignments. 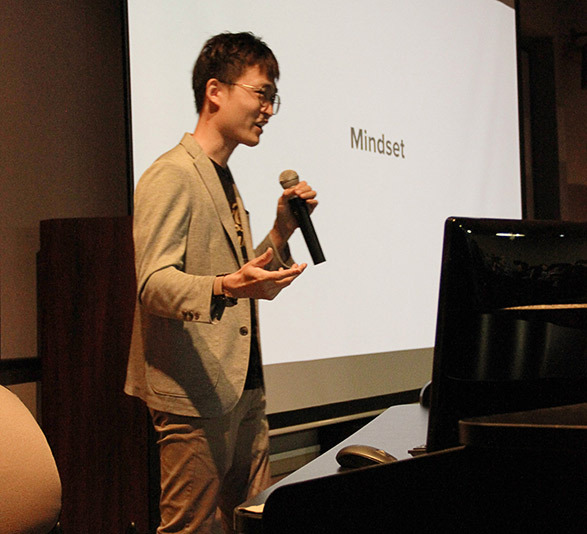 P’ng has won grants from Multimedia Development Corporation (MDeC) to develop games, and upon graduation in 2009, he established the Malaysian-based game studio, Kurechii, with a team of four where he is the Founder and Director. The name is derived from their desire to do the ‘creative’ and ‘crazy’. The foundation started with Yogipoco Adventure (2008), his second-year third semester class assignment. Like most assignments, it was shelved as it was ridden with bugs and did not function well enough for gameplay. However, after graduating, he thought about his time at the academy where he had created many interactive contents, a process he enjoyed doing but prevented from releasing any, out of fear of not meeting people’s expectations. He had a change in mindset, where he wanted to put his project assignment out there for someone to try it. That epiphany was what made him open back the project files and try to complete it in the perspective of a player. With the necessary changes made and put up on game portals, that first game made him RM8,000. It was an exciting revelation that his assignment actually turned into something that makes money. It was interesting to him that there were players who were playing his game seriously. As an avid gamer himself with high expectations regarding games, he only thought of his game as a self-indulgent project. Apart from the monetary incentive, he was motivated by the fact that his game is downloaded and played with appreciation. Having people talk about and appreciate his effort makes it worthwhile. “This change of mindset is very important, because now I know that games actually need to be played by someone else, and I cannot be there to explain it. It has to be self-explanatory and fun,” he explained. In 2010, he developed Reachin’Peachin, a jumping game that took them eight months to complete. During this time, he was also a tutor at The One Academy. He would work on it from nights to the early mornings. The game was published by King - the same developer of the immensely popular Candy Crush Saga, and has garnered 1.2 million downloads up to date. It won ‘Best Casual Games’ at the Kre8tif Awards. “The coolest thing when we make games is actually (the fact that) even until now, there are still people playing them eight years after,” he said. As much as he loves the interactive process of creating games, he realised that he couldn’t continue with it every night while juggling with work. As the solution, he decided to quit his day job in 2011. However, it was not as simple and straightforward as he set out to do. He was alone in his endeavour, unable to convince anyone to join him in his quest. Making games full-time seemed like an unimaginable thing to do. It was an interesting period according to him, he made a lot of self-reflection and questioned his decisions while working alone. That was also the moment he found his passion, discovering that he loves and is good at what he does. His next game, King’s League (2011), was completed in 217 days and garnered 3 million downloads. Its sequel – King’s League: Odyssey (2013), took 12 months to complete and has more than 10 million players. It won the grand prize - ‘Best Game’ at the prestigious IGF (Independent Games Festival) China 2014, marking their proudest achievement, as they created the game from scratch together, all of them being alumni of The One Academy. In 2017, they released Postknight, one of the most popular mobile games and played by more than 8 million players. Its accolades include the ‘Grand Prix’ at IMGA (International Mobile Gaming) SEA and ‘Best Game of 2017’ by Google Play. Passion may be what makes him get started on a game, but discipline is what drives him to complete it. Developing a game is a long process, and not every day is going to be productive. Discipline makes him try to come up with something rather than slacking off. Constant improvement of the mindset is crucial in keeping up with the goal. It is also very important to build a strong rapport with the team. A team that helps and motivates one another through the ups and downs will only become stronger and better. “If you want to go fast, go alone. If you want to go far, go together,” he advised. P’ng Yi Wei, Founder and Director of Kurechii, a Malaysian-based game studio established in 2009. Having the right mindset is important when trying to achieve one’s goal, iterates P’ng. P’ng (front row, third from left) with the attendees of the fruitful and inspiring sharing. The Winners of Malaysia Top 10 Outstanding Young Artists Awards 2018!